Crews from Winthrop and Twisp put out an early-season brush fire at the Methow Valley United Methodist Church that picked up in winds on Monday afternoon. The fire scorched a 100-by-100-foot area before firefighters doused the blaze. 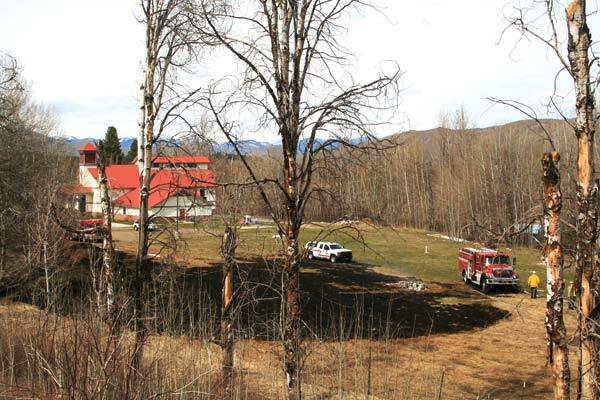 Several engines from Winthrop and Twisp responded to a brush fire at the Methow Valley United Methodist Church that got out of control when winds picked up Monday afternoon (April 9). Wind was pushing the fire toward Highway 20 when crews arrived and quickly extinguished it. The fire had scorched a 100-by-100-foot area before firefighters doused the blaze. The fire season has been “pretty quiet so far,” but there’s still snow around, said Cody Acord, Okanogan County Fire District 6 chief. Acord said he’s been surprised at how quickly things are greening up, since sometimes there’s more of a lag between snowmelt and green growth. “With a lot of dead grass and a slope and wind,” things can get out of control quickly, he said. Fresh, green growth is less of a problem, he said. The church was burning one of several piles of limbs and brush they’d stacked on the lawn. They were doing the right thing and burning one pile at a time, but the wind picked up, spreading the fire onto the grass, said Acord.